When trainloads of minerals were worked over the mainline railways, the long loose coupled trains were supervised by the Guard who rode in his own vehicle at the back of the train. This contained a heavy duty brake to assist stopping the train but also carried the lamps and paperwork record for the train. Visitors will also see the working environment provided for the guard consisting of a warming stove and lookout duckets. The Museum currently has four operational Brake Vans to operate with our trains on the steep branch line but also to provide authentic visitor rides. LMS 20-ton brake van built 1926. LMS 20-ton brake van on Loan from The Furness Railway Trust. 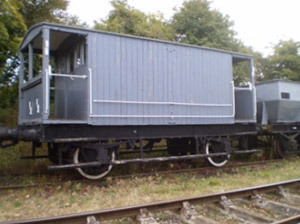 20-ton Brake Van built at Ashford for the Army. BR Shark Brake Van Conversion to passenger vehicle due for completion Spring 2012.